Our new Infusion Center is now open daily 8:30 AM – 5:30 PM in Clinic #1, Suite 100. Our Infusion Center offers short and long-term therapy in a comfortable setting. Our center provides quality care to patients who may not require hospitalization. Patients are admitted directly from physician offices, emergency departments, or other hospitals, and are monitored by a team of expert clinicians with extensive education in outpatient services. Infusion Services include Antibiotic Infusion, IV Hydration, Tysabri Remicade, Venofer, Aredia, Blood Transfusion, Epogen, Neupogen, Neulasta, IV Immune Globulin, Zometa, and PICC Line Insertion & Maintenance. 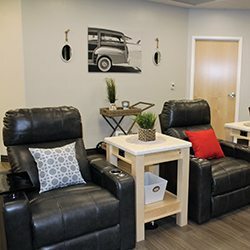 The facility offers comfortable power recliners with charging ports, complimentary wi-fi, warm blankets, and optional ambulatory pumps for home use.